Long stereotyped as a retirement sanctuary with golf as its sole recreational lure, Southern California’s Greater Palm Springs destination continues to generate fresh life through merging nostalgia with sophisticated concepts. Coachella Valley’s nine communities teeter-totter with contrasts showcasing vintage and haute couture shopping, modern resorts and retro motor inns, and a plethora of activities and attractions far beyond those iconic fairways and greens. During the winter, the average high temperature in Greater Palm Springs is 70F in January, 75F in February and 80F in March. That’s not too shabby, especially for those dwelling in areas where daytime highs are barely breaking freezing. With 10 top airlines providing nonstop service from 18 cities, Palm Springs International Airport (PSA) connects to more than global 500 destinations. So it’s easy to book a flight to replace winter blues with skies of blue. Here are the first five of 10 ways to enjoy this sunny desert oasis in its mildest season. Scaling North America’s steepest escarpment, Palm Springs Aerial Tramway is an engineering marvel transporting 80-passenger rotating tramcars through 12 climate zones along a 2.5-mile ascent from cactus to clouds. It’s one “wow” moment after another along the 10-minute ride in each direction. Up to 40 degrees cooler than the Valley floor, Mount San Jacinto State Park’s pristine wilderness at 8,500 feet lures with 50-plus miles of trail adventures spinning from winter cross-country skiing and snowshoeing to summer hiking. Winter sports enthusiasts have the option of bringing their own gear or renting skis, boots, poles and snowshoes at the Adventure Center from mid-November to mid-April. Another perk is that there’s no issue with the conditions on the drive to enjoy this pleasant winter escape to snow since road conditions along the way are void of snow and sleet. Whether simply riding up for the scenery or to catch a little exercise, visitors can refuel with a beautiful view of the Coachella Valley while noshing at Peaks or the cafeteria-style Pines Cafes. Known as the "Mecca of Modernism," Greater Palm Springs is a living chronicle of California's Mid-Century Modern architectural style. It’s such a major part of the desert culture that the destination devotes 10 days each February to Modernism Week. Scheduled for Feb. 16-26, this cultural celebration is one of the Valley’s hottest tickets each winter. Design treasures created by talented 20th-century architects unfold through civic structures, former residences owned or frequented by Hollywood stars and preserved historic neighborhoods exuding the California's “swinging” modernism lifestyles. If timing is off or Modernism Week events are sold out, don’t fret. Lauded as an architectural “Man About Town,” Robert Imber guides six-person Palm Springs Modern Tours that cruise to these ultra-cool structures characterized by large glass windows, flat planes, clean lines and open spaces. Unless the stage is one of the four Grand Slam tennis tournaments played annually in Melbourne, Paris, London and New York City, it’s hard to outshine the BNP Paribas Open held each March at Indian Wells Tennis Garden. Slated for March 6-19, the combined ATPand WTA professional tennis tournament owned by Larry Ellison features top men and women players competing in a 96 singles and 32 doubles draw. Count on cheering a “Who’s Who” roster of stellar court stars that is set to include all four finalists from the 2017 Australian Open – Roger Federer, Rafael Nadal, Serena Williams and Venus Williams – plus Novak Djokovic, Andy Murray and Stan Wawrinka. 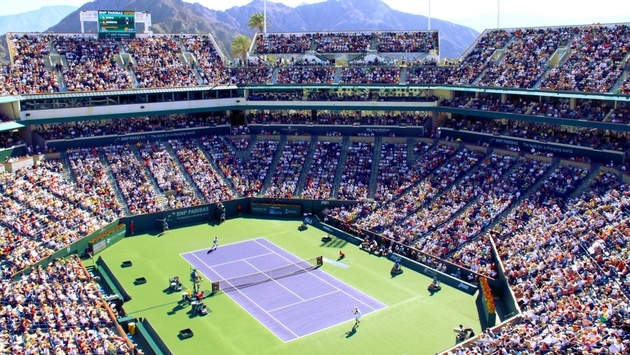 Also garnering buzz at the Indian Wells Tennis Garden is that the 2017 BNP Paribas Open will further indulge fans with multiple improvements to Stadium 1 that include additional private suites, concessions and Wolfgang Puck's Spago. The new Stadium 2 will roll out Nobu, Chop House and Piero’s Pizza Vino as pop-up restaurants. As the only American zoo and botanical garden exclusively dedicated to sandy habitats from across the world, the 1,200-acre Living Desert welcomes nature enthusiasts craving an opportunity to observe its 450 residents covered with shells, scales, feathers and fur. Among these are Africa’s endangered slender-horned gazelle, winged wonders of the Australian Outback, U.S. bighorn sheep and dromedary camels. Winter welcomes Park After Dark evening safaris on select Friday evenings from 6:00-8:30 p.m. Each family-friendly version includes a guided walk through the zoo, up-close animal presentation and s’mores around a campfire. Adult-only evenings enhanced a guided tour of specially selected animal exhibits with a beer, wine, bourbon or vodka tasting opportunity. Fees vary. Between Jan. 22 and Feb. 26, Concerts For Conservation are held on Sundays from 12:30-2:30 p.m. in the Palm Garden that’s covered with paid admission. Dotted with some 110 courses, the Coachella Valley features layouts designed by such big-time golfers as Arnold Palmer, Pete Dye, Jack Nicklaus and Greg Norman. And that’s just at La Quinta Resort & Club and PGA West alone. Dubbed as the “Western Home of Golf in America,” this six-course facility features both private and resort courses geared to all skill levels. Dye’s Stadium Course is rated one of the "Top 100 Courses to Play" (2016-2017) by GOLF Magazine and #4 in Golf Digest’s "Top 50 Toughest Courses in America" (2007). Host to PGA TOUR "Q-School" Finals every other year, PGA TOUR hopefuls must navigate the island green of the 17th hole – known as Alcatraz – as well as the menacing water-lined 18th. At 7,300 yards, this beauty sports the highest stroke (76.1) and slope (150) ratings of all the courses at PGA West. Still referred to as the "Hope" by longtime golf fans, the rebranded CareerBuilder Challenge and Pro-am also brings the PGA TOUR back to La Quinta for the event's 58th annual playing Jan. 18-22. Defending champion Jason Dufner, major championship winner Zach Johnson, and past tournament champs Patrick Reed and Bill Haas have committed to be among the 2017 field.